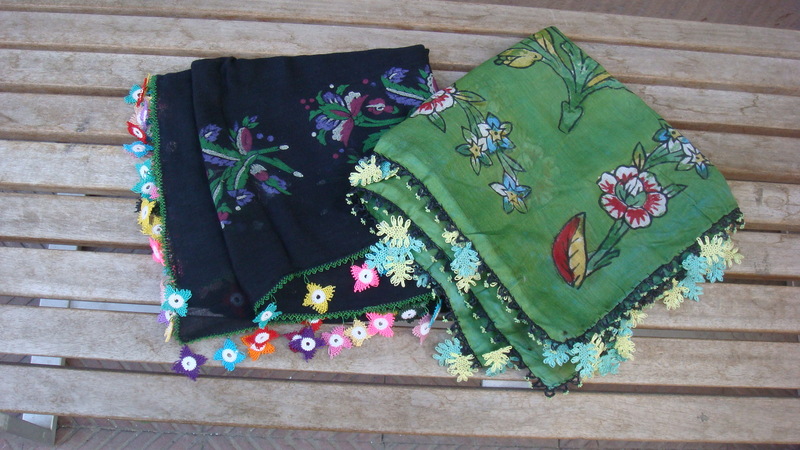 Naturally, I came home from Istanbul with spices, kilims, and a craving for pomegranate juice, however, my Pièce de résistance was what I saw women in Istanbul wearing: headscarves with intricate decorative edging, mostly comprised of flowerlike motifs, an art called Oya. The three-dimensional needlework is incomparable. The motifs and colors historically express the feelings of the woman who make them and it is traditionally sewn onto hand printed cotton scarves using (Yazma). The edging repeats or compliments the pattern of the scarf and some of the results are arresting. There are many machine-made varietals lurking in the Grand Bazaar, but an acute eye will help you separate the wheat from the chaff. Also, if you are lucky, you will find some silk embroidery or some motifs embellished with beads. So lovely. I was told that the art is disappearing with many of the complex patterns in the imagination of the women who make then. When they die, the pattern goes with them. So naturally, I bought as many as I could. A YouTube video showing the craft being made. You can buy them (new) from Istanbul artist, Rengin Yazitas on Etsy. Rengin’s website also has a bit of information and history about the scarves, as does the Turkish government. My photo shows two scarves collected by Kristin Evihan. She is a glassmaker by trade, however, over the years collected a big pile of vintage scarves. She also collects the beaded trims (minus the scarves they were originally attached to). You can contact Kristin at www.evihan.com or at her Etsy store. There’s not a lot of information on the web about this art, but if you Google “Oya” or “Yazma” or “Nallihan*” you will find more. This is so cool – I just watched the video. I have inherited doilies and tablecloths that were crocheted by my grandmother – all lacey and beautiful! You’re right – the patterns will disappear right along with the artists that created the lovely work. I crochet, but nothing this ornate. I guess there is still hope that I have time to learn! Really amazing work; I agree. There is a book I ordered (and hard to find) called Igne Oyalari Needleworks: Oyas and Embroidery Technique by Taciser Onuk, if you are interested. I found a copy on Abe Books.